We present an interactive technique on virtual contact handling for avatars in virtual environments. If a contact has occurred between an articulated avatar and a virtual environment, the global penetration depth and contact points are estimated based on a fast local penetration depth computation for decomposed convex pieces. The penetration depth and contact information are used for geometric overlap avoidance between objects. If applicable, joint angles for an articulated body are computed using an inverse kinematics approach based on cyclic coordinate descent. Resulting dynamic response with friction is modeled with impulse-based dynamics under the Coulomb friction law. We demonstrate the algorithm on a modestly complex virtual environment. The resulting system is able to maintain an interactive frame rate of 30-60 Hz. The following videos show the results we have obtained by using the proposed techniques. 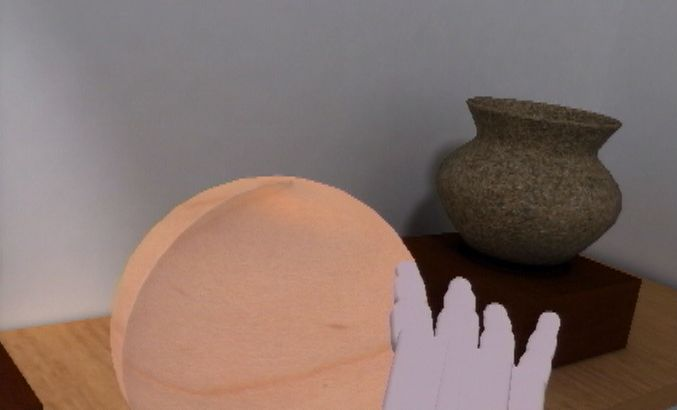 The first five scenes show a hand interacting with a virtual environment using a Cyberglove. These scenes use pure geometric overlap avoidance. Click on the links to view the videos. The hand snips a ball over a table. The hand plays with a ball. The hand is balled into a fist and hits the ball. The hand collides with a table and slides over it. The next four scenes use inverse kinematics to also find suitable joint angles. The avatar motion was simulated by user input through mouse and keyboard because a full-body tracking system was unavailable. An arm slides along a wall. Both arms collide with the wall and slide over it. Both arms and a leg collide with the wall. Selfcollision between the avatar's arms. Click on the link to view the paper. This material is presented to ensure timely dissemination of scholarly and technical work. Copyright and all rights therein are retained by authors or by other copyright holders. All persons copying this information are expected to adhere to the terms and constraints invoked by each author's copyright. In most cases, these works may not be reposted without the explicit permission of the copyright holder. Copyright 2004.